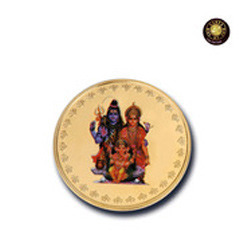 By focusing on variegated demands of our respected clients spread all over the country, we are offering an exclusive range of Shiv Parvati Coins. Designed with utmost precision, the offered range is crafted using quality-tested basic material and advanced technology by our vendors' professionals. In addition to this, our provided range undergoes various tests under the supervision of quality controllers, in order to ensure its flawlessness. Clients can avail these products from us at market leading rates. Established in the year 2012, at New Delhi (India) we, “FZD Overseas Impex LLP", are renowned as the leading Trader, Importer and Supplier of a qualitative assortment of the Large Collections mainly consists of Gold & Silver Plated Playing Cards, Gold Plated Pens, Gold Plated Pens with Artificial Diamond, Pure Gold Flowers, Pure Gold Pocket Cards, Gold Plated Envelopes, Gold Plated Hanuman Chalisa Book, Gold Plated Japaji Sahib Book, Gold Plated Sai Chalisa Book, Gold Plated Religious Books, Gold Plated Coins, Gold Plated Torans (Bandhan Dwar), Gold Plated Photo Frames, Gold Plated Wedding Cards, Gold Plated Invitation Cards, Gold Plated Business Cards, etc. These products are meticulously designed and manufactured as per the defined quality standards at our well known vendors' end. Backed by huge distribution network, we have been able to meet the bulk requirements of the customers within stipulated time frame. Furthermore, we procure these products from the certified and renowned vendors under the guidance of experienced procuring agents. Our vendors make sure to design and manufacture these products, utilizing the optimum quality raw material and contemporary methodologies at their premises. Our offered range is highly appreciated in the market for their flawless finish, precise sizes, long lasting shine, excellent printing and attractive design. These vendors possess expertise in finishing the entire product line as per the specifications detailed by the clients. Made From Pure Gold : The gold used in our products has a purity of 999.9 in a thousand. The products have been certified by the Assay offices in Taiwan, Hong Kong. Silicon Strength : A pure 24kt gold bar is compressed into a thin foil. Then a special plastic silicon base is permanently fused to the delicate gold foil to give it strength & support. The product of this fusion is referred to as 24kt Gold foil and is used to create our unique collection. Our flower and jewellery collection has also been given a lacquer coatingfor protection & durability. Blend of Technology and Tradition: A complete range of products are made of several individual pieces that are laser cut for precision and consistency. These are then fused by the dexterous hands of a traditional artisan. Non Tarnishing: Our products are created to last. They do not tarnish. Customization: We can customize any design into gold foil products.